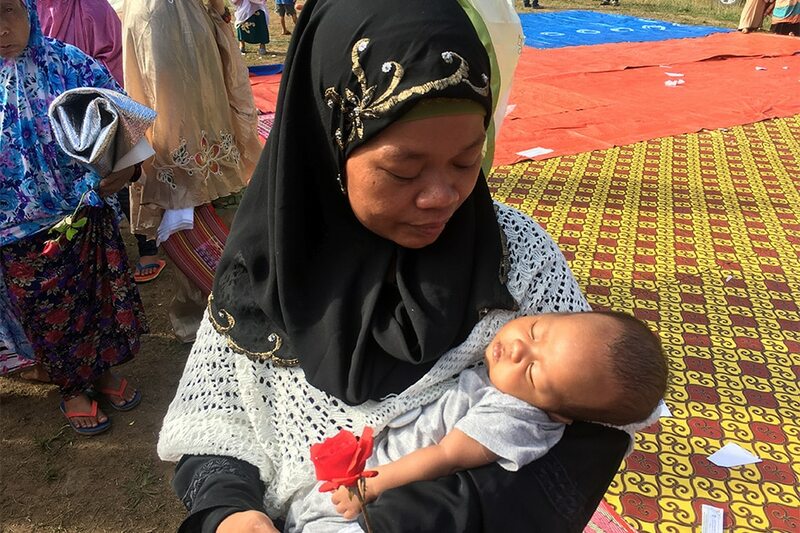 MANILA - In a packed evacuation center in Iligan City, Tarhata Mustari carries her month-old child she initially named Marcial as they try to celebrate Eid al-Fitr on Sunday. Mustari gave birth to her baby last May 23, the day Islamic State-inspired terrorists took over portions of their hometown, Marawi City. She named her baby Marcial at first because it was the day President Rodrigo Duterte declared martial law in the whole Mindanao island. But later on, Mustari said she decided to change the name of her child to Sahir, the Maranao word for peace, hoping for good things to come for her baby boy. "Sana lumaki siyang maging masigla, makapag-aral siya nang mabuti. Sana mahaba pa rin ang buhay naming lahat," the mother said. Mustari said Sahari's name is not yet legal as they have yet to get and sign documents needed from the Marawi City Hall's registry due to the ongoing war. There are over 3,000 displaced Marawi residents staying in five evacuation centers in Iligan City, while 45,604 stay are home-based evacuees, data from the local government show. In Barangay Buru-un alone, there are already some 269 evacuees. The most crowded evacuation center in Iligan is the Santa Elena Gymnasium where around 1,198 uprooted residents stay. Displaced Marawi residents are hoping and praying that the conflict ends as soon as possible so they can return to their homes. But a military spokesman last week said military operations against the Maute and Abu Sayyaf groups in Marawi may still take time. As of latest count, the government said they have killed at least 280 suspected terrorists while there are already 69 deaths on the government side.